So, it’s time to fuel your boat. It sounds simple enough — sidle on up to the gas pump, open the fuel tank and fill ‘er up. But fueling a boat isn’t as mindless as fueling a car. For starters, boats have many openings and if you aren’t paying attention, you could end up mistaking a water or waste valve for the gas tank. Unlike cars, boats have many cracks and crevices where spilled gas and vapors can accumulate, potentially causing an explosion. Follow these tips to avoid disaster. Who’s in charge? If it’s you and you’ll be filling the tank, let everyone know. Too many cooks and your boat could turn into a flambé. Once at the gas dock, all crew and passengers should disembark. Give your boat a check-up. Salt water is corrosive and can cause leaks. Make sure to inspect hose lines, engine fittings and strainers for wear-and-tear. If you spot a leak, patch it. Secure your boat to the gas dock and have everyone go ashore. Turn off all engines and electrical equipment: generators, radios, galley stoves, batteries, etc. Do not smoke or fire up the grill. Seal the boat by shutting all windows, hatches and doors. This will help keep the gas fumes out. Decide how much fuel you’ll need and find the gas fill. Make sure it’s really the gas fill! Take some precautions to safeguard against static electrical sparks and gas spills. 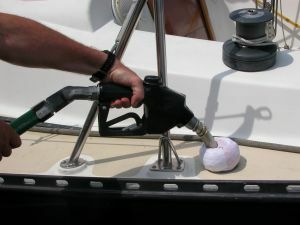 Hold the gas nozzle steady when filling the tank, keeping it in constant contact with the fill opening to avoid sparks. Wrap a towel or other absorbent fabric around the nozzle to prevent backsplash. Leave some room in your tank for the gas to expand. If you spilled any gas, make sure to clean it up completely. Now that you’ve filled your tank, make sure the boat is free of all gas fumes and vapors. Turn on your boat blower for about five minutes. Open up all hatches, windows and doors. Lift the engine hatch and sniff for gas fumes. If you smell any, find out where they’re coming from and fix the problem. Turn on the engine and check it to see that everything is working properly. Make sure there are no fluids in the bilge. Congratulations. You have fueled your boat and steered clear of crisis. Just make sure you didn’t leave any oil or fuel behind — that would be a federal crime. Fair winds!